What is PVC? What are the benefits of using PVC? PVC, polyvinyl chloride, is a polymer commonly used as a replacement for building materials like wood and concrete. Vinyl is great for fences and decks because it requires low-maintenance and is extremely durable. It also comes with a lifetime warranty that covers all manufacturing defects including peeling, flaking, blistering, rotting, and corroding. Plus, it covers any damage from pests or abnormal weathering discoloration. How does the cost of a vinyl fence or deck compare with wood? The initial cost of building a vinyl fence or deck is slightly higher for material costs than if you were to build a wood one. The cost-savings incurred over years of not having to paint, stain, or replace wood will outweigh the initial cost. What colors of vinyl fencing or decking are available? Choose from white, tan, clay and gray vinyl fencing or decking. Do you install the vinyl fence or deck? Currently we do not install, but we work with a a network of other fence companies, home builders, pool companies, and landscapers that you can choose from to help with your project. Does the vinyl fence or deck come with a warranty? Yes. 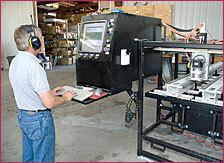 The warranty covers all manufacturing defects including peeling, flaking, blistering, rotting, and corroding. 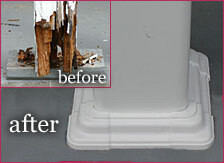 It also covers any damage from pests or abnormal weathering discoloration. The warranty is a transferable life-time warranty offered by the manufacturer. How do I clean my vinyl fence or deck? Your vinyl fence or deck can be cleaned easily by using just soap and water. For more stubborn dirt, a non-abrasive liquid cleanser may be used. Is the vinyl decking slippery? Our decking has a slip-resistant raised texture. Can I add on to my fence in the future? Yes. 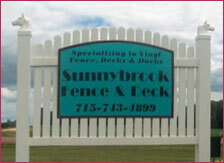 The best thing about a custom vinyl fabricator is our ability to match to an existing vinyl fence. Everyone is talking about going "green". Does this include vinyl? Yes. Vinyl is completely recyclable.